Police have finalised security arrangements for the forthcoming Provincial Council elections to be held on September 8 in the North Central, Eastern and the Sabaragamuwa provinces to ensure a peaceful election and the post election period, Senior DIG Administration and Elections, Gamini Navaratne told the Sunday Observer. Supreme Leader of the Islamic Revolution Ayatollah Seyed Ali Khamenei said Iran and Sri Lanka have proved that resistance against hegemonic powers is possible. 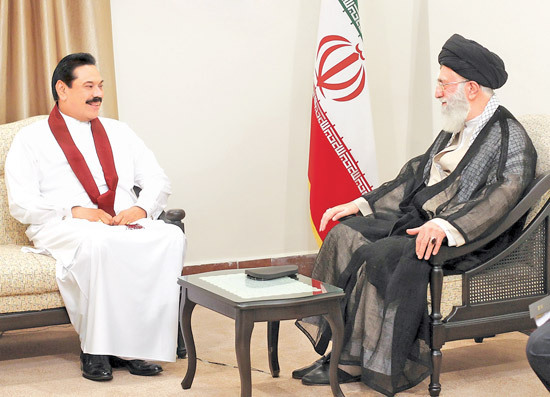 At a meeting with President Mahinda Rajapaksa in Tehran on Friday, Ayatollah Khamenei called for closer friendly ties among Muslim nations in a move to empower them on the international scene and secure wider interests. The 58th Commonwealth Parliamentary Association (CPA) conference will be held in Sri Lanka from September 7 to 15 under the theme “Ensuring a relevant Commonwealth for the future”. Nearly 800 delegates from 54 Commonwealth countries will attend the conference, the biggest event to be held in Sri Lanka since the three- decade terrorism was eradicated in 2009. Today is the 61st anniversary of the Sri Lanka Freedom party (SLFP), the main constituent of the ruling United People’s Freedom Alliance. The SLFP was founded by the late S.R.W.D. Bandaranaike on September 2, 1951. He became the Prime Minister when the SLFP formed its first Government by winning the 1956 general election.